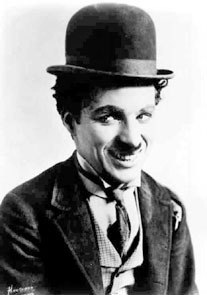 He was born in Walworth, London, England to Charles Chaplin, Sr. and Hannah Harriette Hill, both Music Hall entertainers. His parents separated soon after his birth, leaving him in the care of his increasingly unstable mother. In 1896, she was unable to find work; Charlie and his older half-brother Sydney had to be left in the workhouse at Lambeth, moving after several weeks to Hanwell School for Orphans and Destitute Children. His father died an alcoholic when Charlie was 12, and his mother suffered a mental breakdown, and was eventually admitted to the Cane Hill Asylum at Coulsdon, near Croydon. She died in 1928. Charlie first took to the stage when, aged 5, he performed in Music Hall in 1894, standing in for his mother. As a child, he was confined to a bed for weeks due to a serious illness, and, at night, his mother would sit at the window and act out what was going on outside. In 1900, aged 11, his brother helped get him the role of a comic cat in the pantomime Cinderella at the London Hippodrome. In 1903 he appeared in Jim, A Romance of Cockayne, followed by his first regular job, as the newspaper boy Billy in Sherlock Holmes, a part he played into 1906. This was followed by Casey's Court Circus variety show, and, the following year, he became a clown in Fred Karno's Fun Factory slapstick comedy company. According to immigration records, he arrived in the USA with the Karno troupe on October 2, 1912. In the Karno Company was Arthur Stanley Jefferson, who would later become known as Stan Laurel. Chaplin and Laurel wound up sharing a room in a boarding house. Stan Laurel returned to England but Chaplin remained in the USA. His act was seen by film producer Mack Sennett, who hired him for his studio, the Keystone Film Company. While Chaplin initially had difficulty adjusting to the Keystone style of film acting, he soon adapted and flourished in the medium. This was made possible in part by Chaplin developing his signature Tramp persona, and by eventually earning directorship and creative control over his films, which enabled him to become Keystone's top star and talent. His salary history suggests how rapidly he became world famous, and the skill of his brother, Sydney, at being his business manager. 1917: First National, $1 million deal — the first actor ever to earn that sum. He also formed his own independent production company, the Charles Chaplin Film Corporation, which made him a very wealthy man. Chaplin built his own Hollywood studio in 1918, and assumed an unparalleled degree of artistic and financial independence over his productions. Using this independence, over the next 35 years he created a remarkable, timeless body of work that remains entertaining and influential. These include comedy shorts (such as A Dog's Life (1918) and Pay Day (1922)), longer films (Shoulder Arms (1918) and The Pilgrim (1923)), and his great silent feature length films: The Kid (1921), A Woman of Paris (1923), The Gold Rush (1925), and The Circus (1928). After the arrival of sound films, he made City Lights (1931) and Modern Times (1936), essentially silent films scored with his own music and sound effects. His dialogue films made in Hollywood were The Great Dictator (1940), Monsieur Verdoux (1947), and Limelight (1952). Modern Times (1936), a silent movie, did feature some dialogue. It is actually his first movie where his own voice is heard. However, it is still, majorly and essentially, a silent film. In 1919 he founded the United Artists film distribution company with Mary Pickford, Douglas Fairbanks and D. W. Griffith, and served on the board of UA until the early 1950's. Although "talkies" became the dominant mode of moviemaking soon after they were introduced in 1927, Chaplin resisted making a talkie all through the 1930s. It is a tribute to Chaplin's versatility that he also has one film credit for choreography for the 1952 film Limelight, and one credit as a singer for the title music of the 1928 film The Circus. The best-known of several songs he composed are "Smile", famously covered by Nat King Cole, among others, and the theme from Limelight, which won a belated Oscar for best film score in 1973. His first dialogue picture, The Great Dictator (1940) was an act of defiance against Adolf Hitler and fascism, filmed and released in the United States one year before it abandoned its policy of isolationism to enter World War II. Chaplin played a fascist dictator clearly modeled on Hitler (also with a certain physical likeness), as well as a Jewish barber cruelly persecuted by the Nazis. Hitler, who was a great fan of movies, is known to have seen the film twice (records were kept of movies ordered for his personal theater). After the war and the uncovering of the Holocaust, Chaplin stated that he would not have been able to make such jokes about the Nazi regime had he known about the actual extent of the pogrom. Chaplin's political sympathies always lay with the left. His politics seem tame by modern standards, but after the 1940's his views (in conjunction with his influence and fame) were seen by many as dangerously radical. His silent films made prior to the Great Depression did not contain overt political themes or messages, apart from the Tramp's plight in poverty. But his films made in the 1930's were more openly political. Modern Times (1936) depicts the dismal situation of workers and the poor in industrial society. The final dramatic speech in his 1940 film The Great Dictator, which was critical of patriotic nationalism, was highly controversial, as was his vocal public support for the opening of a second European front in 1942 to assist the Soviet Union in World War II. The critical view of capitalism in his 1947 black comedy Monsieur Verdoux was hugely controversial, with the film being protested at many US cities. Although Chaplin had his major successes in the United States and was a resident from 1914 to 1952, he retained his British nationality. During the era of McCarthyism, Chaplin was accused of "un-American activities" as a suspected communist; and J. Edgar Hoover, who had instructed the FBI to keep extensive files on him, tried to end his United States residency. In 1952, Chaplin left the US for a trip to England; Hoover learned of it and negotiated with the INS to revoke his re-entry permit. Chaplin then decided to stay in Europe, and made his home in Vevey, Switzerland. He briefly returned to the United States in April 1972, with his wife to receive an Honorary Oscar. Chaplin won the honorary Oscar twice. When the first Oscars were awarded on May 16, 1929, the voting audit procedures that now exist had not yet been put into place, and the categories were still very fluid. Chaplin had originally been nominated for both Best Actor and and Best Comedy Directing for his movie The Circus, but his name was withdrawn and the Academy decided to give him a special award "for versatility and genius in acting, writing, directing and producing The Circus" instead. The other film to receive a special award that year was The Jazz Singer. Chaplin's second honorary award came 44 years later in 1972, and was for "the incalculable effect he has had in making motion pictures the art form of this century". He came out of his exile and collected his award less than a month before the death of J. Edgar Hoover. Upon receiving the award, Chaplin received the longest standing ovation in Academy Award history, lasting a full five minutes from the delighted, enthralled star-studded studio audience. Chaplin was also nominated without success for Best Picture, Best Actor, and Best Original Screenplay for The Great Dictator, and again for Best Original Screenplay for Monsieur Verdoux (1947). In 1973, he received an Oscar for the Best Music in an Original Dramatic Score for the 1952 film Limelight, which co-starred Claire Bloom. The film also features a cameo with Buster Keaton, which was the first and last time the two great comedians ever appeared together. Because of Chaplin's difficulties with McCarthyism, the film did not open in Los Angeles when it was first produced. This criterion for nomination was not fulfilled until 1972. His final films were A King in New York (1957) and A Countess From Hong Kong (1967), starring Sophia Loren and Marlon Brando. Chaplin's professional successes were repeatedly overshadowed by his private life, particularly with regard to his politics and his pattern of relationship with young women. On October 23, 1918, the 28 year old Chaplin married the 16-year-old Mildred Harris. They had one child, Norman Spencer Chaplin, who died in infancy; they divorced in 1920. At 35, he became involved with 16-year-old Lita Grey during preparations for The Gold Rush. They married on November 26, 1924 after she became pregnant. They had two sons, the actors Charles Chaplin Jr. (1925-1968) and Sydney Earle Chaplin. Their extraordinarily bitter divorce in 1928 had Chaplin paying Grey a then-record-breaking $825,000 settlement. The stress of the sensational divorce, compounded by a tax dispute, allegedly turned his hair white. The publication of court records, which included many intimate details, led to a campaign against him. Chaplin and actress Paulette Goddard were involved in a romantic and professional relationship between 1932 and 1940, with Goddard living with Chaplin in his Beverly Hills home for most of this time. After the relationship ended, Chaplin made public statements that they had been secretly married in 1936, but in private he claimed they were in fact never officially married. In any case, their common-law marriage ended amicably in 1942, with Goddard being granted a divorce and settlement. Afterwards, Chaplin briefly dated actress Joan Barry, but ended it when she started harrassing him and displaying signs of severe mental illness. In May 1943, she filed a paternity suit against him. Blood tests proved Chaplin was not the father, but as blood tests were inadmissible evidence in court, he was ordered to pay $75 a week until the child turned 21. Shortly thereafter, he met Oona O'Neill, daughter of Eugene O'Neill, and married her on June 16, 1943. He was 54; she was 17. This marriage was a long and happy one, with eight children. They had three sons Christopher Chaplin, Eugene Chaplin and Michael Chaplin and five daughters Geraldine Chaplin, Josephine Chaplin, Jane Chaplin, Victoria Chaplin and Annette-Emilie Chaplin. In April 1972, Chaplin returned to America to accept an Honorary Academy Award. The presentation is remembered as one of the emotional highlights in all of Academy Award history. Chaplin's weeklong return visit to the US, his last, also included numerous honors in both New York and Los Angeles. On March 4, 1975 he was knighted as a Knight of the British Empire by Queen Elizabeth II. The honour was first proposed in 1956, but vetoed by the British Foreign Office on the grounds that he sympathized with the left and that it would damage British relations with the United States, at the height of the Cold War and with planning for the ill-fated invasion of Suez underway. Chaplin died on Christmas Day, 1977 in Vevey, Switzerland, following a stroke, aged 88, and was interred in Corsier-Sur-Vevey Cemetery in Corsier-Sur-Vevey, Vaud. On 1 March 1978, his body was stolen in an attempt to extort money from his family. The plot failed. The robbers were captured, and the body was recovered 11 weeks later near Lake Geneva. There is a statue of Chaplin in front of the alimentarium in Vevey to commemorate the last part of his life. Amongst his many honours, Chaplin has a star on the Hollywood Walk of Fame and in 1985 he was honoured with his image on a postage stamp of the United Kingdom and in 1994 he appeared on a United States postage stamp designed by caricaturist Al Hirschfeld. In 1992 a film was made about his life entitled Chaplin, directed by Oscar-winner Sir Richard Attenborough, and starring Robert Downey Jr., Dan Aykroyd, Geraldine Chaplin (Charlie's daughter, portraying Charlie's mother, her own grandmother), Sir Anthony Hopkins, Milla Jovovich, Moira Kelly, Kevin Kline, Diane Lane, Penelope Ann Miller, Paul Rhys, Marisa Tomei, Nancy Travis, and James Woods. In a 2005 poll to find The Comedian's Comedian, he was voted among the top 20 greatest comedy acts ever by fellow comedians and comedy insiders. All his life, Chaplin was known to be an avowed atheist. He had nothing but contempt for any form of religion. He once joked, "I would love to play the part of Jesus! I fit it perfectly because I am a comedian".